Has making calls to Chile from the U.S. started to feel like a chore? Then follow our helpful “How to Call Chile” guide below and simplify! Next dial 56 – the Chile country code. Then dial the 1/2-digit area code (calling code list below). And finally, the 6/7-digit phone number. Need more help calling Chile? International calls that are blocked – Several service providers allow users to block international calling or even use “blocked” as a default. Double check this setting. This does not apply to Vonage World®. Cell numbers that don’t have area codes – Area codes shouldn’t be added to international cell phone numbers, and further, in most countries, cell phone numbers have a dedicated starting digit not used for landlines. No trunk code – If you’re dialing a number starting with zero, drop that first digit. The zero is referred to as a “trunk code” and is used only when calling within certain countries. Internet phone (VoIP) connections – A few VoIP providers let you forego dialing 011 before making an international call. If that feature is turned on however, leave out the 011 U.S. code. That’s HOW you call Chile, but what’s the BEST PLAN to call Chile with? 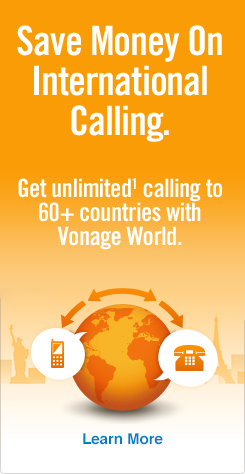 You’ve used Vonage World® for unlimited¹ calls to landlines in Chile. And it’s been great. But now, you need more. It’s time to upgrade your plan to Vonage World Plus Latin America 100*. It’s the path to free calls to Chile, so get Vonage World Plus Latin America 100* today by calling 1-800-583-5421!